Major economic event of the Mediterranean region, the Mediterranean Economic Week is celebrating its tenth anniversary. The 2016 edition which is taking place at the ‘Villa Méditerranée’ in Marseille from the 2nd to the 5th of November will have the theme of “Digital Technology – for a connected Mediterranean”. For this new edition event, coordinated by OCEMO, companies will be the real focus. “Our priority is to value the know-how of companies which are participating in the digital revolution” highlights Pierre Massis, General Delegate of OCEMO. “We are especially going to value experiences and present success stories, which could be sources of inspiration for other companies. The company village and the networking space will encourage promotion, exchanges and B2B meetings between representations of large industrial groups, project owners, potential investors and SMBs (small and medium businesses) in the digital domain”. This event on digital technology will be the opportunity to address three dimensions: digital technology - economic sector and service tool for other sectors; digital technology – an answer to current social challenges; and Marseille and the Mediterranean: Euro-African exchange hub. 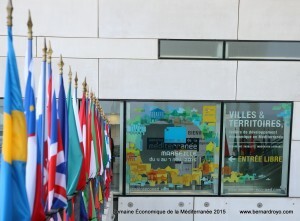 “It’s the first time that the Mediterranean Economic Week is opening itself up to Africa. This opening is such a direction carrier as relationships between Europe, the Southern Mediterranean and Africa are important and the development potential proves to be considerable. Marseille is positioned as a connected hub, a strategic base, ideally situation which is a real advantage for companies and potential investors” comments Elsa Larue de Tournemine, communications manager at OCEMO. During the 2015 event, 20 countries were represented and more than 300 experts and key figures intervened as part of the 35 events. In 2016, more than 3000 participants are expected during this major event; this tool of territorial attractiveness. The global coordination of the Mediterranean Economic Week is done by the Office for Economic in the Mediterranean and the East (OCEMO) which is also participating in its funding.